Mercedes to drop R class wagon in U.S.
Mercedes will continue to sell the R class outside the U.S. until at least 2015. 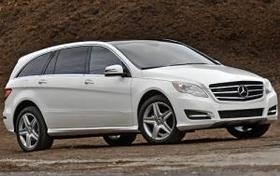 DETROIT -- Mercedes-Benz will drop the slow-selling R-class wagon from its U.S. lineup after the 2012 model year. But the German automaker will continue to build the R class at its U.S. plant in Alabama for export to other markets. Mercedes U.S. dealers sold 293 units of the R class through the first two months of this year, one-third less than the number sold in the first two months of 2011. In 2011, R-class demand in the United States dropped 19 percent to 2,385. Mercedes will continue to sell the wagon in other markets. The automaker sold 4,421 R-class models in Europe last year, a rise of 26 percent on 2010, according to market researchers JATO Dynamics. January sales slipped 31 percent to 272 units.